Parasailing! KK is well known for its water sports and we took a trip by boat to Pulau Sapi. The first thing we did was parasailing. It costs RM 180 for two people – tandem on a single chute. 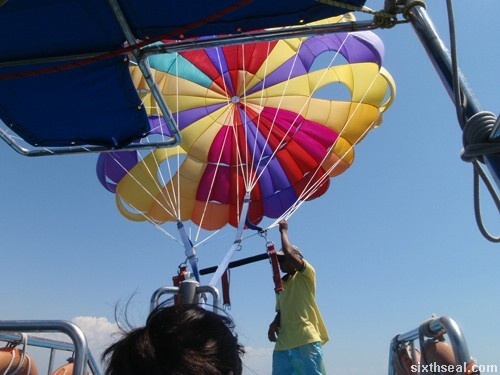 Jerine paid for the parasailing experience – cheers! I wanted to go diving but she doesn’t have a PADI license so I figured we might as well do something together since we’re on vacation. 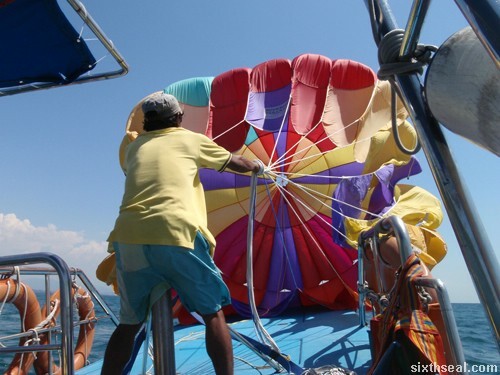 Anyway, back to parasailing – it involves the boat driving out to open water and the operators setting up the chute. You strap yourself into this harness and the entire trip gives you 15 minutes of pure pleasure. You can ask the operator to customize the experience to your tastes – we went for full speed, full height and a full dip into the water until the shoulders. It’s a lot of fun – unfortunately, we couldn’t go full throttle coz of the winds (parachute = wind resistance) but it was damn enjoyable. 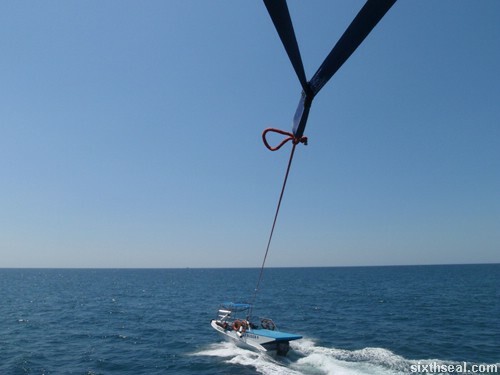 The experience is like nothing else – you just need to trust the harness and let go while being up, up, up in the air before dipping into the open waters of the seas.